Keep your dwelling clean – particularly the kitchen, the bathrooms, carpets and floors. Regular vacuuming, mopping and using a household cleaner to clean hard surfaces is important to remove the household dirt and debris that harbor mold or food for mold. Immediately throw away moldy food. Remove visible moisture accumulation on windows, walls, ceilings, floors and other surfaces as soon as reasonably possible. Turn on any exhaust fans in the bathroom and kitchen before you start showering or cooking with open pots. When showering, be sure to keep the shower curtain inside the tub or fully close the shower doors. Also, the experts recommend that after taking a shower or bath, you: (1) wipe moisture off of shower walls, shower doors, the bathtub and the bathroom floor; (2) leave the bathroom door open until all moisture on the mirrors and bathroom walls and tile surfaces has dissipated; and (3) hang up your towels and bath mats so they completely dry out. Promptly notify us about any air conditioning or heating system problems you discover. Follow our rules regarding replacement of air filters. Also, it is recommended that you periodically open windows and doors on days when the outdoor weather is dry to help humid areas of your dwelling to dry out. Promptly notify us about any signs of water leaks, water infiltration or mold. We will respond in accordance with state law and the Lease Contract to repair or remedy the situation, as necessary. Keep the thermostat set on the “AUTO” setting (not “FAN”) to automatically circulate air in the event temperatures rise to or above 78 degrees. 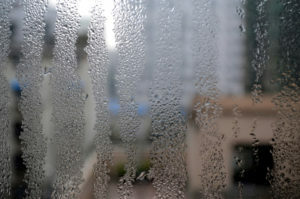 Relative humidity levels should be maintained under 50% at all times in order to prevent conditions conducive to the growth of mold and mildew.